The North American Sabreliner, later sold as the Rockwell Sabreliner, is an American mid-sized business jet developed by North American Aviation. It was offered to the United States Air Force (USAF) in response to its Utility Trainer Experimental (UTX) program. 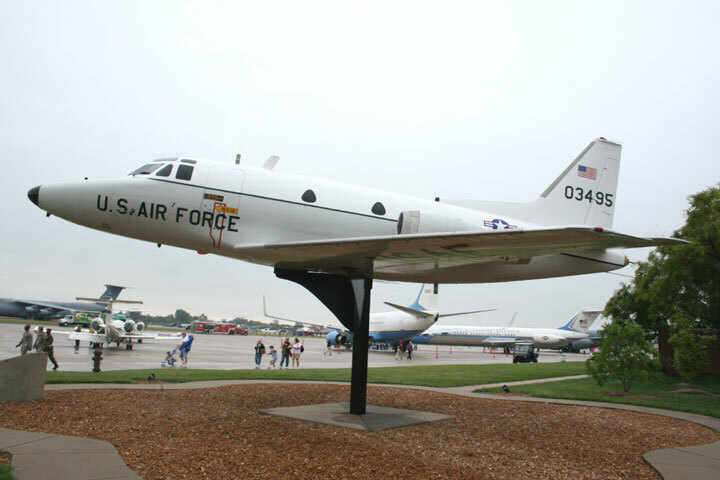 It was named "Sabreliner" due to the similarity of the wing and tail to North American's F-86 Sabre jet fighter. Military variants, designated T-39 Sabreliner, were used by the USAF, United States Navy (USN) and United States Marine Corps (USMC) after the USAF placed an initial order in 1959. The Sabreliner was also developed into a commercial variant. North American Aviation began development of the Sabreliner as an in-house project, and in response to the UTX request for proposals, offered a military version to the USAF. UTX combined two different roles, personnel transport and combat readiness training, into the same aircraft. The civilian version prototype, which carried the model number NA-265, made its first flight on September 16, 1958. It was powered by a pair of General Electric YJ85 turbojet engines. The type received its FAA type certification in April 1963. The UTX candidate, designated the T-39A, was identical in configuration to the NA-265, but when the contract was awarded and the T-39A entered production, it was powered by two Pratt & Whitney JT12A-8 turbojet engines. The civilian production version, or Series 40, was slightly refined over the prototype, with more speed and a roomier cabin. North American then stretched the design by 3 feet (0.91 m) and 2 inches (51 mm), providing greater cabin space, and marketed it as the Series 60, which was certificated in April 1967. The cabin was made taller for the Series 70 and General Electric CF700 turbofans were installed for the Series 75A (also branded as the Series 80). By 1973, North American had merged with Rockwell Standard under the name Rockwell International. In 1976 Rockwell contracted Raisbeck Engineering to redesign the wing of the Sabreliner series. The resulting Raisbeck Mark V wing was the first supercritical wing in service in the United States. The Mark V wing was combined with Garrett TFE731 turbofan engines, to create the Series 65. Sabreliner models 60 and 80 were retrofitted with the Mark V wing as the Series 60A (STC SA687NW) and Series 80A (STC SA847NW). Sabreliner production came to a close in 1981. The next year, Rockwell sold its Sabreliner division to a private equity firm which formed Sabreliner Corporation, the support organization for continuing operators. Over 800 Sabreliners were produced, of which 200 were T-39s. A number of retired military T-39s have also entered the civilian world, since the military versions also carry FAA type certification. As of May 2007[update], 56 examples have been lost in accidents. The Series 65 was the last series run and 76 of them were produced, mostly for the private market. Monsanto has the oldest continuously operating company corporate jet division starting with its purchase of a Saberliner 40. T-39s were used in support of combat operations in Southeast Asia during the Vietnam War. In late 1965 T-39s replaced Martin B-57 Canberras on flights to transport high-priority cargo, such as exposed film from photoreconnaissance missions, from outlying bases to Saigon. The original Navy version, the T3J-1, redesignated T-39D after the 1962 redesignation of USN/USMC/USCG aircraft, was initially fitted with the radar system from the McDonnell F3H-1 Demon all-weather fighter and used as a radar trainer for pilots of that aircraft. The T-39D aircraft was subsequently introduced into the Basic Naval Aviation Observer (NAO), later Student Naval Flight Officer (SNFO) program. Three versions of the T-39D were used throughout the 1960s, '70s, and '80s: one without radar for high altitude instrument navigation training and low altitude visual navigation training in the SNFO Intermediate syllabus, a second variant equipped with the APQ-126 radar from the LTV A-7 Corsair II for training primarily bombardier/navigators, reconnaissance attack navigators and electronic countermeasures officers in attack aircraft, and a third variant with the APQ-94 radar for training pilots of the Vought F-8 Crusader. The T-39N and T-39G are currently used in the NFO Strike and Strike Fighter syllabi in training USN and USMC student Naval Flight Officers, as well as various NATO/allied/coalition student navigators. Foreign students also train in the T-39 in place of the Beechcraft T-1 Jayhawk during the Intermediate Jet syllabus. The Sabreliner requires a minimum crew of two, and depending on cabin configuration, can carry up to seven passengers (NA-265 through NA-265-40) or ten passengers (NA-265-60 and subsequent models). As a Navy flight training aircraft, it will typically fly with a pilot, one or two NFO instructors, and two to three student NFOs or student navigators/CSOs. Being derived from the F-86, the Sabreliner is the only business jet authorised for aerobatics and is used by two California companies: Flight Research Inc. and Patriots Jet Team, for inflight upset-recovery training to reduce loss-of-control, involving full stalls, fully inverted flight and 20-40° descents in a 2.8g enveloppe, within its 3g rating. (NA265 or NA246) Prototype powered by two General Electric J85-GE-X turbojet engines, one built sometimes unofficially called XT-39. (NA265-40 or NA282) Civil production variant for 11 passengers powered by two Pratt & Whitney JT12A-6A or -8 engines, two cabin windows each side; 65 built. A Sabreliner marketing version of the Sabre 40 with lighter avionics similar to the Aero Commander, also produced by Rockwell International at the time. In addition to the lighter avionics package, the interior was redesigned for lighter construction. (NA265-50 or NA287) One built in 1964 as a Model 60 with Pratt & Whitney JT12A engines, experimental platform for radome nose cowling. (NA265-60 or NA306) Stretched Model 40 for 12 passengers with two Pratt & Whitney JT12A-8 engines, five cabin windows each side, 130 built. Series 60 with Mark V super-critical wing. (NA265-65 or NA465) Based on the Series 60 with Garrett AiResearch TFE731-3R-1D engines and new Mark V super-critical wing, 76 built. (NA265-70 or NA370) Series 60A with a raised cabin roof for greater cabin headroom, two Pratt & Whitney JT12A-8 engines; nine built. (NA265-80 or NA380) Sabreliner 75 powered by two General Electric CF700 turbofan engines, 66 built. Series 80 with Mark V super-critical wing. Series 80 without the Mark V super-critical wing. powered by two Pratt and Withney JT9D-3A compact engines. Pilot proficiency trainer and utility transport for the United States Air Force. Based on Sabreliner prototype but powered by two 3,000 lbf (13 kN) Pratt & Whitney J60-P3 engines, 143 built. T-39A modified as a cargo and personnel transport, powered by Pratt & Whitney J60-P3/-3A engines. One T-39A modified for electronic systems testing. Radar systems trainer for the United States Air Force, fitted with avionics of the Republic F-105D Thunderchief fighter bomber (including R-14 NASARR main radar and AN/APN-131 doppler radar) and with stations for three trainees, six built. Proposed radar systems trainer fitted with avionics of McDonnell F-101B Voodoo all-weather interceptor. Unbuilt. (NA265-20 or NA277) Radar systems trainer for the United States Navy, equipped with AN/APQ-94 radar for radar intercept officer training and the AN/APQ-126 radar for bombardier/navigator training. (T3J-1 prior to 1962 redesignation program. ), 42 built. United States Navy cargo/transport version, with JT12A-8 engines, originally designated VT-39E, seven second-hand aircraft. Electronic warfare crew training conversion of the T-39A for the United States Air Force, for training of F-105G "Wild Weasel" crews. United States Navy cargo/transport version based on the stretched fuselage Sabreliner 60, Pratt & Whitney JT12A engines equipped with thrust reversers, 13 bought. CT-39G modified for the Undergraduate Flight Officer Training program. U.S. Navy T-39N in Centennial of Naval Aviation commemorative paint scheme in 2011. Navy trainer for the Undergraduate Flight Officer Training program. Original United States Navy designation that became the T-39D in 1962. On January 28, 1964, a USAF T-39 Sabreliner flying from West Germany on a training mission crossed into East German airspace and was shot down by a Soviet Mikoyan-Gurevich MiG-19 near Vogelsberg, killing all three on board. On April 13, 1973, a Sabreliner NA-265-60 operated by Continental Airlines, N743R, crashed after takeoff at Montrose Airport in Montrose, Colorado following the uncommanded deployment of the port side thrust reverser. The two pilots, the only occupants of the aircraft, were killed and the aircraft was destroyed by impact forces and a post impact fire. On February 23, 1975, a Sabreliner 75A operated by General Motors with registration number N5107, crashed on final approach 4 miles (6.4 km) from Pontiac, Michigan. The aircraft was damaged beyond repair. The only occupants of the aircraft were the pilot and co-pilot, of which the pilot was killed in the crash. The accident was attributed to improper IFR operation. On December 21, 1975, BuNo 157352, a USN T-39E conducting a Transport Aircraft Commander-Syllabus One (TAC-1) flight, crashed along the Mendocino Ridge, approximately 10 miles (16 km) southwest of Ukiah, California. Two U.S. Navy pilots were killed. On April 1, 1977, BuNo 150545, a USN T-39D conducting a Student Naval Flight Officer low-level flight training sortie, crashed in the Laguna Mountains 8 miles (13 km) east-southeast of Julian, California killing all five instructors and students aboard. On April 20, 1985, AF ser. No. 62-4496, a USAF CT-39A experienced brake failure on landing at the Wilkes-Barre/Scranton International Airport, killing all five passengers and crew aboard, including General Jerome F. O'Malley, Commander, Tactical Air Command. On June 3, 1988, an Ecuadorian Air Force Rockwell Sabreliner NA265-40A crashed in Quito, killing all 11 people on board, including the commander of the Ecuadorian Air Force and a high ranking officer of the Israeli Air Force. On July 12, 1988, a US Navy CT-39E ditched off the coast of Vietnam after running low on fuel following failure of the aircraft's navigation system. [clarification needed] The crew of three was rescued by the Vietnamese Navy and returned to the United States. 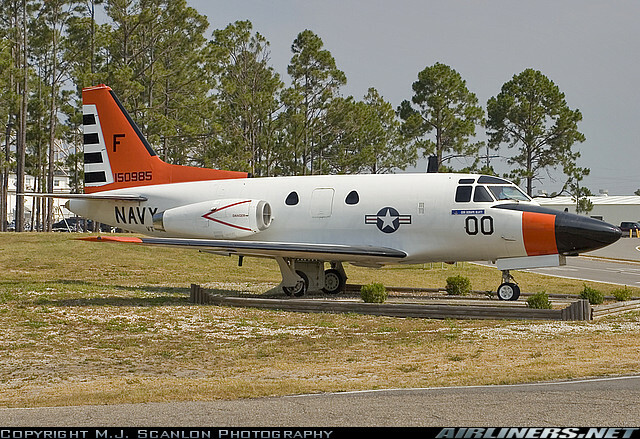 On May 8, 2002, two USN T-39Ns from Training Squadron 86 (VT-86) at NAS Pensacola, Florida, collided in mid-air during Student Naval Flight Officer air intercept training 40 miles (64 km) off the Gulf Coast, killing all seven instructors and students on board the two aircraft. On January 13, 2006, a USN T-39N Sabreliner conducting Student Naval Flight Officer/Student USAF Navigator-Weapon Systems Officer low-level flight training crashed in a densely forested area in rural Georgia, killing all four crew members. On August 16, 2015, a private Sabreliner collided with a Cessna 172 on approach to Brown Field Municipal Airport in southern San Diego County, California, killing the five people on board the two aircraft. The cause was found to be Air Traffic Control error. On April 15, 2019, a Sabreliner 65 crashed about 10:30 p.m. Saturday between New Albany and Blue Springs, Mississippi, killing all 3 people on board the aircraft. Sabreliner 40 at Spartan College of Aeronautics and Technology in Tulsa, Oklahoma. It was Bob Hoover's demonstration plane. ^ a b c d "Boeing: Historical Snapshot: T-39 Sabreliner Trainer/Transport". Boeing.com. Archived from the original on 21 August 2017. Retrieved 30 April 2018. ^ a b c d e "Airliners.net". Airliners.net. Archived from the original on 11 October 2007. Retrieved 30 April 2018. ^ "North American T-39A Sabreliner Archived 2016-10-22 at the Wayback Machine". National Museum of the United States Air Force. ^ "Sabreliner Structural Repair Manual – All Models NA-265 Aircraft", Report No. NA-66-1032 Revision 10, March 16, 1990. ^ Company Bio Archived 2014-10-06 at the Wayback Machine Retrieved August 18, 2014. ^ Mathwing, George E., "The Rockwell International Sabreliner 65 Case Study in Aircraft Design"
^ "Rockwell Sabreliner Archived 2011-02-23 at Wikiwix. 56 hull-loss occurrences, last updated 5 May 2007." Aviation Safety Network. ^ William Garvey (Mar 29, 2019). "One Of The Historical Sabreliner's Still-Relevant Roles". Aviation Week & Space Technology. ^ Ranter, Harro. "ASN Aircraft accident North American CT-39A Sabreliner 62-4448 Vogelsberg village, Thüringen". aviation-safety.net. Archived from the original on 3 October 2014. Retrieved 30 April 2018. ^ Ranter, Harro. "ASN Aircraft accident Rockwell Sabreliner 75A N5107 Pontiac, MI". aviation-safety.net. Archived from the original on 8 January 2015. Retrieved 30 April 2018. ^ Ranter, Harro. "ASN Aircraft accident North American CT-39E Sabreliner 157352 Ukiah, CA". aviation-safety.net. Archived from the original on 25 August 2013. Retrieved 30 April 2018. ^ "San Diego air crash kills 5". Star-News. Pasadena,CA. 2 April 1977. p. 1. ^ Ranter, Harro. "ASN Aircraft accident North American CT-39A-1-NO Sabreliner 62-4496 Wilkes-Barre International Airport, PA (AVP)". aviation-safety.net. Archived from the original on 22 August 2013. Retrieved 30 April 2018. ^ "accident record". Archived from the original on 23 August 2015. Retrieved 21 August 2015. ^ Ranter, Harro. "ASN Aircraft accident North American Rockwell CT-39E Sabreliner 158381 Spratly Islands [South China Sea]". aviation-safety.net. Archived from the original on 25 August 2013. Retrieved 30 April 2018. ^ "National Briefing – South: Florida: Search For Crash Victims". The New York Times. May 10, 2002. ^ "Arlington Cemetery website". Retrieved 2 March 2012. ^ Perry, Tony (16 August 2015). "Two planes collide near San Diego's Brown Field; 3 dead". Los Angeles Times. Retrieved 16 August 2015. ^ "AUTHORITIES: 5 DEAD IN MIDAIR COLLISION OF SMALL PLANES IN SAN DIEGO COUNTY". Associated Press. 16 August 2015. Archived from the original on 18 August 2015. Retrieved 16 August 2015. ^ "Educating Controllers on Two Midair Collisions" (PDF). National Transportation Safety Board. 14 November 2016. Archived (PDF) from the original on 19 November 2016. Retrieved 19 November 2016. ^ User, Super. "SABRELINER". Pimaair.org. Retrieved 30 April 2018. ^ "North American T-39A Sabreliner." Archived 2016-10-22 at the Wayback Machine National Museum of the US Air Force. Retrieved: 13 September 2015. ^ "Photographic image of aeroplane" (JPG). Airclassicsmuseum.org. Retrieved 26 August 2018. ^ "Item - National Naval Aviation Museum". navalaviationmuseum.org. Retrieved 30 April 2018. ^ "Rockwell Collins donates flight-test aircraft to Evergreen Aviation & Space Museum". Industrial-newsroom.com. Retrieved 26 August 2018. "Model Designation of Military Aerospace Vehicles" (PDF). United States Department of Defense. 2004-05-12. pp. 60–61. Archived from the original (PDF) on 2004-11-14. Retrieved 2007-01-20. Wikimedia Commons has media related to North American Sabreliner. This page was last edited on 17 April 2019, at 02:02 (UTC).